Greek finance minister Yanis Varoufakis has acknowledged that his country is desperately short of funds, accusing Europe’s creditor powers of trying to force his country to its knees by “liquidity asphyxiation”. “Liquidity is drying up in Greece. It is true,” he told a gathering at the Brookings Institution in Washington. Mr Varoufakis said a conspiracy of forces was trying to “snuff out” Greece’s Syriza government but warned that this could have devastating effects. 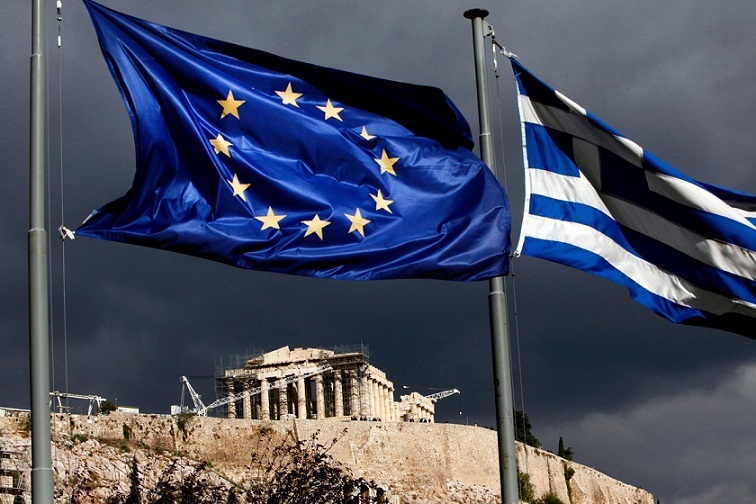 “Toying with Grexit, or amputating Greece, is profoundly anti-European. Anybody who says they know what will happen if Greece is pushed out of the euro is deluded,” he said. “I wouldn’t be overly confident that just because the Greek economy is small relative to the size of the European economy that something like that wouldn’t be a major dislocation. I think everybody should be a little bit concerned,” he said. Christine Lagarde, the head of the International Monetary Fund, said the IMF is worried about the “liquidity situation” in Greece but made it clear that the institution would not give the country any leeway on €1bn of debt repayments coming due in early May. “We have never had an advanced economy asking for payment delays. It is clearly not a course of action that would be fit or recommended,” she said. Mrs Lagarde insisted that the the Fund would defend the interests of its contributors, many of them much poorer countries than Greece. Mr Varoufakis said the European Central Bank and the EMU authorities were deliberately tightening the tourniquet on Greece until the arm was “gangrenous” in order to pressure his Syriza government to give in. “I would willingly, eagerly, accept any terms offered to us if they made sense. Insisting on a primary budget surplus of 4.5pc in a depressed economy with no functioning banking system is absurd. We have the right to challenge the logic of a programme that has failed,” he said. He was speaking before a reception to celebrate Greek independence at the White House. It is understood that he spoke privately with President Barack Obama, though not at the Oval Office. Wolfgang Schauble, Germany’s finance minister, said it is up to Greece to decide its own fate. “If they want to find money somewhere else, whether in Moscow, or Beijing, or New York, that’s fine, we’ll be happy,” he said. “We will not help a country that refuses to help itself. If Greece wants the next disbursement of €1.8bn, it must fulfil what is agreed. That is called the Memorandum of Understanding,” he said, also speaking at the Brookings Institution. “There can be no mutual liablity in Europe. Providing debt relief and transfers won’t help any country. The problem of moral and political hazard in Europe isn’t some narrow-minded mantra,” he said. Mr Schauble did not explicitly rule out Grexit, saying only that his government would not take any steps that “endanger the global economy”. Mr Schauble admitted that the EU-IMF Troika measures may never restore Greece to solvency, dismissing it as a “problem for future decades”. This confirms what Syriza has always argued, that the country will continue lurching from one crisis to another under the current policies, requiring yet another bail-out in the early 2020s. Economic contraction has already pushed Greece’s public debt to 177pc of GDP. Mr Varoufakis said there would be “nothing easier” for Syriza than to sign on the dotted line dishonestly – like previous governments – in order to shake loose the final €7bn tranche of bail-out funds. “It would be the wrong thing to do. It would be wrong for our people and for every citizen of Europe. It would reinforce our image as a bottomless pit. We are not going to sign up to commitments that we know our economy can’t meet,” he said. “We will not settle for another version of extending and pretending, that gives Greece’s debt-deflation spiral another twirl,” he said. Mr Varoufakis said Greece had gone from “Ponzi growth” during the EMU debt bubble to a form of “Ponzi austerity” that had done nothing to restore the country’s viability or tackle the deep malignancies of the Greek social economy. “We have to earn the trust of our European partners, but they must also acknowledge that for five years they have been imposing a programme that makes matters worse. They need to convince us that they’re serious about rebooting,” he said. Mr Varoufakis clearly won the intellectual beauty contest in Washington, where most economists and officials broadly agree with his macro-economic analysis. His German counterpart – and nemesis – was careful to lavish him with praise, but could not resist an oblique swipe. “Yanis Varoufakis is a great economist, but not the first in history,” he said. Their love affair goes on.